Laws of physics - Solar System Planets And Moons Section. Laws of physics begin to break down. Opportunity rover's Landing Site Could Have Once Been Under Water. Brian Hynek, an associate researcher from the University of Colorado at Boulder thinks he's found evidence for a vast ocean or lake that once covered the region around NASA's Opportunity rover landing site. The data comes from the Mars Global Surveyor and Odyssey spacecraft, which have extensively mapped the area. He estimates that the ocean must have been 330,000 square km (127,000 square miles), which is more than all the Great Lakes combined. Hynek used several pieces of evidence to make this prediction, including gray hematite scattered around the whole region, and outcrops of sedimentary rock. Bizarre Matter Found in a Neutron star. 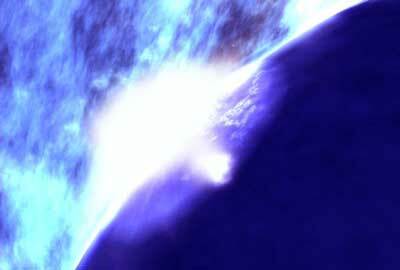 Scientists have theorized that the inside of a neutron star - the remnant from a star that has collapsed under its own gravity - is a special place where the laws of physics begin to break down; atoms are squeezed so tightly by gravity that all protons and electrons are crushed into Neutrons which swirl around like a liquid, but without friction (called a superfluid). This theory has gotten some confirmation according to new research from NASA which observed neutron star EXO 0748-676, located 30,000 light years away. Using various instruments, NASA scientists determined that it's approximately 11.5 km (7 miles) in diameter, and contains 1.75 solar masses. With this much mass packed into a small area, the observations match the theory that neutron stars exist in this superfluidic state, but without being crushed further. NASA specialists have begun cleaning up after the sample capsule from its Genesis capsule slammed into the ground at high speed in the Utah desert. The ground crew took their time picking up the capsule because there could have been live explosives, which failed to eject the capsule's parachute as it entered the atmosphere. Even though it was going 311 kph (193 mph) when it smashed into the ground, scientists were surprised at how little damage was actually done. Some of the wafers that had collected particles of the Sun's solar wind were actually unharmed, so scientists will be able to extract some useful particles; although, they could be contaminated with air, water and dirt after the rough landing. Cassini Finds a New Ring Around Saturn. Scientists from the United Kingdom have uncovered a new object and a new ring orbiting Saturn. While Cassini images, scientists at the University of London noticed a tiny object skirt around the outer part of the F-ring - it's probably 4-5 km (3 miles) in diameter. They also discovered a new ring in the same area, which is associated with Saturn's Moon Atlas. This ring was only seen as Cassini was approaching Saturn, so scientists aren't sure if it goes all the way around the planet. While attempting to pin down the orbit of the new moon, scientists from the Space Science Institute in Boulder turned up another potential object in a similar orbit. Bought a digital camera recently? It's probably got anywhere from 3.1 to 6 megapixels of resolution. Well, the European Space Agency is building a 1 gigapixel (a gigapixel is 1024 megapixels) digital camera for its upcoming Gaia space telescope, due for launch in 2010. It's actually not a single camera, but an array of 170. Gaia will be positioned 1.5 million km (930,000 miles) away from Earth, and will be designed to simultaneously photograph 1 billion stars and plenty of other celestial objects like asteroids, comets, galaxies, and nebulae. The goal will be to map the entire universe down to a resolution one million times fainter than the human eye can see.